Our Family Craftsman Will Take Good Care Of You! At AZ Lucky Star Auto Service our primary goal is to provide every customer the best automotive service and repair possible to keep our customers safe and on the road. We are extremely proud of the reputation we have for quality, honesty and dependability. Our facility is very clean and we take pride in everything that we do. Our Master Mechanics and technicians are well trained to diagnose and resolve any issue that you experience from a basic oil change to more complicated engine and transmission repairs. We offer the latest in technology so our technicians can diagnose all issues and perform the necessary repairs. As you can see from our list of services, we provide just about any service that your vehicle needs. Cooling system failures are the leading cause of mechanical breakdowns on the road. Overheating caused by a poorly performing cooling system can also lead to performance problems and even failures of the engine and transmission. Your vehicle’s coolant plays a vital role in the performance and longevity of your vehicle. One of the simplest, most effective and inexpensive ways to help protect the life of your car is to change the oil and oil filter regularly. We recommend having an oil change service every 3-5,000 miles. This is a beneficial service that can head off a potential breakdown because a skilled technician is checking your vehicle three times a year if you drive the average 15,000 miles per year. We are automatic transmission troubleshooting experts. Many so-called automatic transmission problems are not transmission problems at all. A faulty computer chip, an intermittent “prndl” switch (park-reverse-neutral-drive-low), a leaking vacuum line, and many other seemingly unrelated problems might be diagnosed as a transmission problem by others. Drivers who heed dashboard warnings may save money in the long run and ultimately help ensure their own safety. When a warning light on your dashboard alerts you to one or more problems, bring your vehicle in for a dashboard warning diagnostic. Equipped with the right tools, our friendly staff will inspect your dashboard indicator lights and use special equipment to verify and help fix automotive issues. 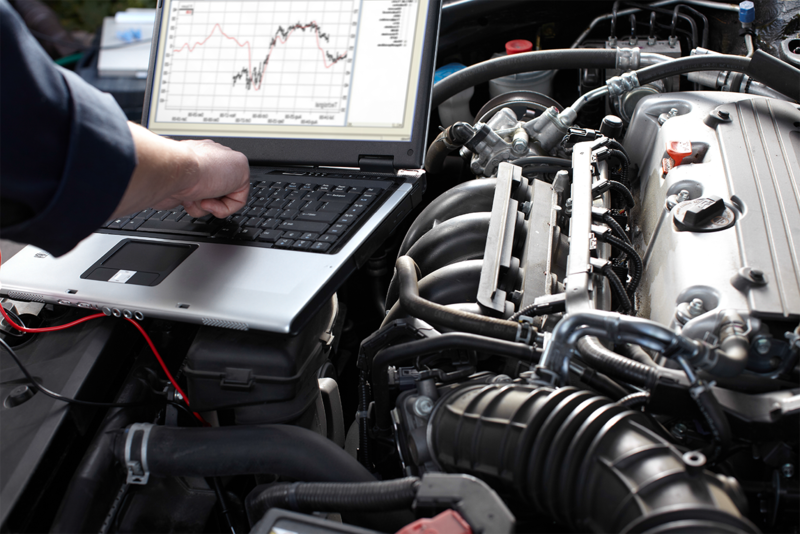 From underinflated and overinflated tires to low oil levels and faulty lighting systems, our employees are ready to use our diagnostic testing tools to read and interpret the messages from your vehicle’s dashboard warning system. In the event that your dashboard warning system is malfunctioning and sending out a false warning, our expert staff can also be of service. If you’re automobile’s air conditioning is blowing hot air, come to AZ Lucky Star Automotive for a diagnostic. We’ll visually inspect hoses, lines, seals and other components for leaks, check temperature readings, check that your compressor is operating properly, and inspect the drive belt for cracks or damage. Regular wheel alignments are an important service. Properly aligned wheels improve driver safety, enhance your driving control, increases fuel efficiency and maximizes the life of your tires. A proper alignment gives you better control of your vehicle at higher speeds and can provide a more comfortable ride. It also prevents front or rear suspension parts from wearing out prematurely. A fuel induction service is done because carbon deposits accumulate on engine valves, combustion chambers, intake manifold ports, fuel injectors, air intake plenum, and throttle body housing causing loss of power, rough idle, hesitation, misfire, pinging, knocking, poor mileage and hard starting.